And finally we get to the 14 greatest romantic dramas. When compiling this list I found that of the 14 films that I put in the top 14, 9 of them have the death of a loved one—in only 3 of those was the death not of one of our romantic couples, and that’s an arguable number as one of those Death himself is involved as the romantic lead in one of those 3. (Of the honorable mentions 6 of the 8 involve death). Of the five films where no one dies, two involve a major character being seriously injured (and also in one of the honorable mentions). It is not safe to be in a romantic drama. With only two exceptions can I say there is not a major amount of tragedy. (Due to the fact that I started tearing up while writing this, this will be split into two blogs). There movies are here to remind us that all the pain and hurt and feeling like your life is over is all worth it, because love is worth it. Obviously this is one of the happier ones on this list, of course that might have something to do with the fact that I couldn’t quite decide whether to put this in the comedy or drama list. Obviously drama won out by the slightest of edges. You know you love it. Our star-crossed lovers are endlessly screwed up but together they find the balance and success they were looking for. Long distance relationships are usually a problem…more so when it’s time not distance separating you. For a movie where the two main characters hardly have any screen time together, and spend most of it in voiced over conversations between letters, it has more passion and romance than most of what Hollywood churns out. It’s never explained how or why they’re able to communicate through a magical mailbox…but who cares. What matters is that Reeves and Bullock make their romance come alive without even being in the same shot. If ever there was a movie that showed that a lot of times it’s type-casting and directing that conspire to make or break an actor, it’s this film. I’m not going to say that Keanu deserved an Oscar for this performance, but it is not the lifeless and hollow performance that we have come to expect from him in every other film. Okay, I promise this is the last love story on the list that involves odd time travel plot lines…at least until the honorable mentions. Artist Eben Adams (Joseph Cotton) and Jennie (Jennifer Jones). Eben a man in his 30’s is being beaten down by life and is about to just give up when he meets Jennie, a young girl about 12. While not attracted to her in any way, he finds her personality magnetic…and her mention of historical events 30 years out of date as if they were yesterday was odd. It gets stranger when he sees her a week later and she’s aged five years. Through a little research he find that Jennie is from the past and is somehow coming into his time at different points in her life, and the magic of it all begins to reinvigorate his life. As she starts popping in closer to his age he does begin to fall in love with her and it becomes clear that they were meant for each other, even if they’re in different times. And when he learns that she died in the past he desperately tries to save her. Now this movie has its flaws. Namely that Joseph Cotton is in 90% of the scenes and Joseph Cotton couldn’t act to save his life; the man deserved a lifetime achievement award from the Razzies. Now, given how much I hate Cotton’s acting and still love this movie should tell you the quality of Jones’ acting and the script. I would love to see this remade, despite the perfect performance of Jones, simply because Cotton was incredibly miscast as a romantic lead…however I know that will never happen because while we might forgive the innocence of a movie made in the 1940’s, to make a movie nowadays where a 30 year old man falls in love with a 9 year old (even if he really didn’t start falling in love with her until she was of a legal age) would just come off as disturbingly pedophilic, and rightly so. So unless a genius scriptwriter and director can figure out a way around this, I will have to settle for Cotton in a movie that even he couldn’t ruin. Two people who have lost finding joy in life because of various tragedies in their lives. Oh the tragedies Lewis (Christian Slater) and Lisa (Mary Stuart Masterson) have endured. But together, eventually, we hope, they work everything out and have each other to lean on. This is the part where you’re supposed to say “Wait!” I’m supposed to leave, and that’s where you forgive me for being such a coward, and for being the last one to figure out what everyone already knew. Then you call “Wait! Don’t go! Stop!” and we hold each other and we know everything’s going to be okay. I guess I’m not familiar with the procedure. Yeah…I guess not…. …Um… I’ll see you around. A love story after the fact, about a man who loved his wife so much that when faced with imminent death he is more concerned with how she will be able to get past the loss. Now that’s love. 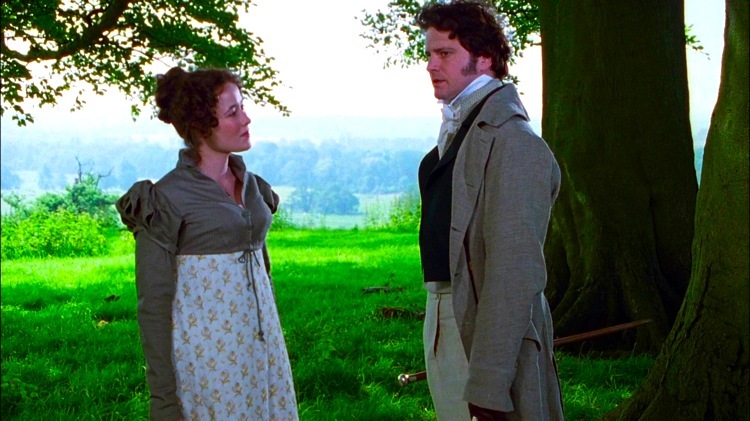 The BBC version with Colin Firth as Mr. Darcy! There exists no other version! Besides the more than obvious reasons why this makes it onto the list (It’s Pride and Prejudice do I really have to justify why it’s here?) I love this film because I share many a personality trait with Darcy (if you stop to think about it that’s not really a compliment, we both seem to embrace our inner arrogant jerk). Again the BBC version with Timothy Dalton as Rochester. Like the Pride and Prejudice version I like this one because it doesn’t cut anything from the story. I know this is one of the most dysfunctional relationships in all of literature (with the possible exception of Wuthering Heights, what is it with the Brontes?) but I can’t help root for Jane and Rochester. …Tomorrow…the top 7…and honorable mentions.